Preface. 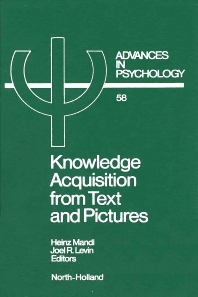 Approaches to Knowledge Acquisition from Text and Pictures. Problems in Knowledge Acquisition from Text and Pictures (S. Molitor, S.-P. Ballstaedt, H. Mandl). Presentation of Information by Media and its Effect on Mental Models (N.M. Seel, P. Strittmatter). Knowledge from Text and Pictures: A Neuropsychological Perspective (M.J. Farah). Learning from Texts and Pictures: Reflections on a Meta-Level (G. Salomon). A Transfer-Appropriate-Processing Perspective of Pictures in Prose (J.R. Levin). Understanding Visual and Verbal Messages (P. Baggett). The Design and Use of Instructional Graphics (W. Winn). Towards a Graphic Ecology (M. Macdonald-Ross). Research on Knowledge Acquisition from Text and Pictures. When Good Pictures Fail: An Information-Processing Approach to the Effect of Illustrations (B. Weidenmann). Understanding Machines from Text and Diagrams (M. Hegarty, M.A. Just). Visualization by Pictorial Analogies in Understanding Expository Text (L.J. Issing, J. Hannemann, J. Haack). Two Functions of Diagrams in Problem Solving by Analogy (M.L. Gick). Developmental Studies of Text-Picture Interactions in the Perception of Animated Cartoons with Text (G. D'Ydewalle, J. Van Rensbergen). The Processing of Texts Describing Spatial Configurations ( G. Denhière, M. Denis). Trends in the Delayed Use of Information from an Illustrated Text (J. Peeck). Intercultural Experiments as a Research Tool in the Study of Cognitive Skill Acquisition: Japanese Character Recognition and Eye Movements in Non-Japanese Subjects (K. Koga, R. Groner). Author Index. Subject Index. Media-didactics have recently become more firmly grounded on cognitive theory, with an increasing concern for the internal processes of knowledge representation and acquisition. With this cognitive aspect in mind, an international group of researchers held a meeting in Tübingen, Federal Republic of Germany, to present and discuss the theoretical approaches to and empirical investigations of knowledge acquisition from text and pictures. This volume contains the revised contributions resulting from that meeting.